Native title parties need to prove an ongoing connection. Often numerous parties are involved. Processing applications can take many years which lets some politicians find strange "solutions". Native title legislation is not without issues. There are several problems which challenge native title parties and those involved in finding a solution. The Native Title Act was originally handed down so that Aboriginal people could negotiate and mediate to resolve recognition of Aboriginal peoples' ongoing connection with their land. But as more and more native title cases take many years, sometimes decades, to be resolved in courts rather than by negotiation, critics of the Act ask the Australian government to review and amend it. One of the toughest requirements of the Act is that claimants have to be able to prove a continuity of traditional laws and customs on the land being claimed since European settlement. Legal Special Counsel Robyn Glindemann in 2012 discussed the key developments in native title law since the Mabo decision. Under the Native Title Act Aboriginal people have to prove their 'ongoing' connection to the land they want to claim native title for. This ongoing connection is often difficult to prove, especially where there has been widespread urbanisation or agricultural development, both of which extinguish native title. Aboriginal wars with the white invaders, forced removal from their traditional lands (Stolen Generations) and many massacres of Aboriginal people exacerbate claims further. The law requires a high level of evidence of each group's traditional connection which needs to go back to the date when the Crown asserted sovereignty over Australia . Providing connection information is expensive and there is limited expertise available in Australia to develop these reports . Connection reports can take 2 to 3 years to research and may take up to 3 years to be assessed. During World War II Aboriginal people lost their ongoing connection around Darwin because they were evacuated from the Japanese bombing. "Judges haven't been able to take in account any mitigating circumstances, and that break is enough to throw the case out," says Tom Calma, Aboriginal and Torres Strait Islander Social Justice Commissioner . Evidence used to prove Aboriginal people's connection to their land can sometimes date back over one hundred years, as exemplified in the Yorta Yorta people's native title case which used the 1881 petition of the Maloga residents to the Victorian government . For the Gomeroi people's claim over areas in New South Wales computer mapping of family trees for 60,000 people, the largest known genealogy of Aboriginal people ever, along with hundreds of birth, death and marriage certificates demonstrated that the old way of life was still very much alive in Gomeroi country stretching from Singleton to Moree and out to Walgett . The National Native Title Tribunal libraries can offer crucial evidence with their collection of rare and old books . The Tribunal has offices in all major Australian capitals and offers personal assistance and email alerts. However, cases exist where courts have denied recognising native title while at the same time acknowledging that the people before the court are the same people that owned that land at the time of colonisation . Another problem is that, when a connection can be proven, the land is usually of low commercial value because it is remote from urban areas, which requires land owners to live away from mainstream work opportunities. Hence ongoing traditions, which are required to claim the land, and hold it, geographically disadvantage Aboriginal land holders. As a consequence of extinguished native title the Indigenous Land Corporation was established to purchase land for groups who would not be able to prove native title. It can take decades for Aboriginal people to have their native title claims acknowledged, but it only takes a few days for their land to be compulsorily acquired by the government. Apart from time and tide, governments, it seems, also don't wait for anyone. Australian governments are lobbied a lot by the resource industry and ever too willing to follow temptation, or money. 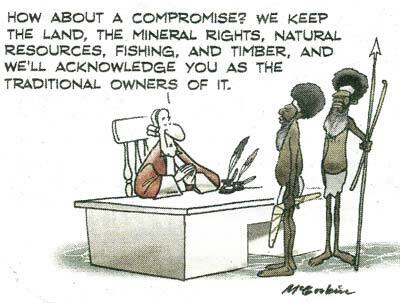 Aboriginal rights to land come secondary. In late 2010 the West Australian government served notice on traditional owners to compulsorily acquire land so that a commercial mining company could develop a processing plant for liquefied natural gas. "This [court case] is an issue for [t]his development but frankly it’s an issue for just about every development in Australia where native title issues are involved," Prime Minister Malcolm Turnbull said. "You’ve got to be able to reach agreements to get the development." How many times did you agree to terms & conditions without fully understanding them because you wanted to move on? What if I presented you with a legally binding document in a language that is not your mother tongue? ILUAs are contracts, and some of them are lacking essential information. Some "have no commencement date and no end date, or, in the alternative, have a start date but no end date". Anderson calls these documents "sleezey, deceitful and fraudulent" because "there are open-ended indemnity clauses with no specification as to what the proponent parties are indemnified against" and clauses which seek consent for validating "all acts necessary to give effect to this agreement" without specifying which, or by listing agreements that have had no Aboriginal input in the past. ILUA parties are required to agree that the Native Title claimants "…validate any invalid Agreed Acts done on the agreed Agreement Area prior to the Registration Date, to the extent that they are future acts", in other words, the wrongdoings of the past colonial era are now in the same category as future acts. "It is totally illegal to try and bind anyone to an unspecified future act," writes Anderson. "A future act would need to be defined in a statement to that effect in the ILUA itself and the claimants need to be made aware of this." If Aboriginal people agree to an ILUA they also agree to "to permanently relinquish Native Title Rights and interests that may exist in relation to the Surrender Area" effective "immediately before a deed of grant is issued". Anderson is sure that Aboriginal people do not understand the true nature of the consequences. "We can assume that in the vast majority of cases the ramifications and consequences have not been fully explained to our people by their lawyers," he says. It is generally agreed in ILUAs that compensation arises, but, Anderson notes, it is generally followed by a statement in the ILUA which releases the state "from liability for any Claim and acknowledge that this Agreement may be pleaded as an absolute bar against any claims by the... [claimant parties]." Aboriginal people relinquish any further right or entitlement to compensation. "How in the world can any of our people agree to something like this," Anderson asks. "Was the ILUA ever translated into the[ir] mother tongue?" For native title claims, parties can be numerous and diverse and their relationships complex. The Thalanyji people's claim in Western Australia involved more than 35 parties , the Gunditjmara people's case in Victoria involved hundreds of parties which were divided into 27 groups. Besides the expected anthropologists, archaeologists, and lawyers, native title groups can include local, state and Commonwealth governments as well as representatives from the mining, pastoral, pearling, fishing, bee-keeping, telecommunications and many other industries. The fact that these parties usually don't know, or interact with, each other complicates the mediation process. Parties might not have been in dispute with each other, but the native title claim brings them into a potential conflict. Claims can overlap with neighbouring claim areas, and any such disputes need to be resolved. About 45% of claims in 2008 had areas that overlapped with other claims . If more than one Aboriginal group are claiming native title disagreements between Aboriginal groups can delay or even derail native title claims. One group might decide to lodge their own claim or disagree with the other group's decision, and claims might have to go back to the drawing board, taking many more years to be resolved. Splits might also cause disagreements between families who have relatives on both sides , creating an environment for lateral violence. If elders' views conflict with the agenda of others they might be deliberately excluded from native title deliberations . Disagreements between Aboriginal parties sometimes split families "forever" . Families who stuck by each other for generations are no longer on talking terms because of the conflict that has emanated from native title disputes. In rare cases evidence found during research for a native title claim can lead to an Aboriginal group taking on a new identity . This shows how ancestral knowledge got lost in the process of dispossession. 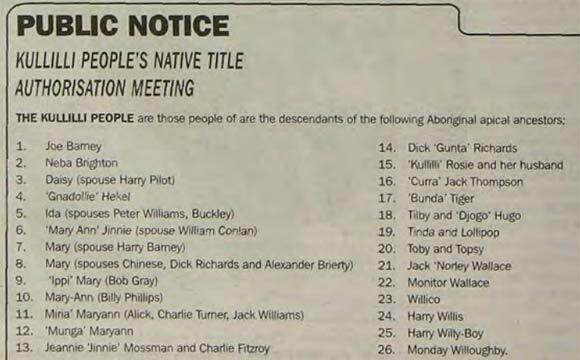 Public native title notice (detail) with a list of people whose descendants are eligible to become a party of the claim . There is no requirement for a company exploring for resources to approach traditional Aboriginal owners directly if native title has not been determined for the area . Hence local people sometimes know about the potential for minerals exploration from newspaper advertisements. But even if native title exists it is no guarantee mining cannot start on the land. As the online news site The Stringer put it : "The Native Title Act is set up in such a way that both parties must enter into ‘good faith’ negotiations and hopefully come to a mutually beneficial deal within six months. "If this fails you can count on the mining still going ahead. You can also count on the National Native Title Tribunal in granting the various licences required by the resource company and you can count on the Office of the Registrar of Aboriginal Corporations to stand idly by." Take TOs to the Native Title Tribunal to seek approval for the state to override their opposition. Pay for TOs to convene, including transport and food (which can be substantial, given the sometimes large number of groups involved). Organise their own meeting after that of the TOs in order to get people to agree to their Memorandum of Understanding to override any Indigenous Land Use Agreement. Excluding TOs that represent opposing groups from meetings, claiming they are "disruptive". Even if there is just one party making a claim and everyone acknowledges that they are the right people it is still difficult to settle claims and 'straightforward' claims can take a decade or more to reach an outcome . Since both state and federal governments are involved in the native title process they wait for each other and exchange blame . On average it takes 6 years to finalise a contested native title claim . The first native title claim ever lodged (in 1994) was settled in November 2010 . "One of the main reasons resolutions are delayed is the time it takes to prepare and assess the 'connection' material needed to show claimants' links to their traditional land or waters," says National Native Title Tribunal President Graeme Neate . Even if a judgement by a single judge has been made it might not be the final word. In April 2008 the Full Court unanimously found that a judge had not applied the correct legal analysis in his interim decision. It sent the case back to a single judge for further hearing--almost 13 years after the first native title claim had been lodged . From 1993 to 2011 around 1,300 claims were lodged, but only 121 native title determinations resulted, covering just over 10% of the land mass at a cost to the taxpayer of over $900 million dollars . Map of land subject to native title applications in Australia in 2010 . It takes an average of six years to process each, and over 420 applications were still due in April 2010. Map of land where native title has been found to exist in 2010 . 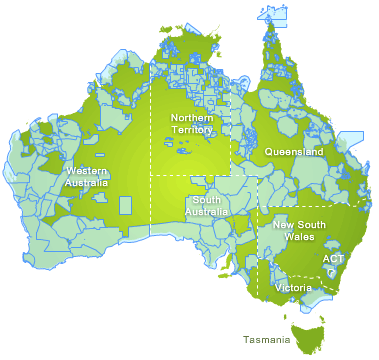 Note the few native title determinations in Queensland and New South Wales, Australia's most densely populated states, and the absence of any determination in urban areas populated by non-Indigenous people. A land rights compromise many mining companies would like to have. Commodity values are estimated in the billions, yet compensation is often tokenistic. Cartoon: Malcolm McGookin. Used with kind permission. Many Aboriginal people live on land rich in resources which will bring wealth for Australia, but delivers little for its Indigenous peoples. A common misconception is that Aboriginal people receive millions of dollars "for nothing" just because mining companies set up camp on their land. Compensation is what the government owes Aboriginal people when it acquires an area of their traditional country, in a similar way as any private homeowner would be compensated if their property was compulsorily acquired for, say, a main road development . Sometimes governments evade their responsibility to deliver basic services including health, housing and education in lieu of compensation payments which is wrong, says Indigenous Professor Marcia Langton . "Compensation provisions have never been used successfully," says Aboriginal and Torres Strait Islander Social Justice Commissioner Tom Calma . The problem is that native title can easily be extinguished, it is impossible to 'revive' extinguished title, and there's a lack of either a right of veto or a statutory entitlement to any royalties from mining . Private payments negotiated with mining companies allow these access to traditional lands. Some mining companies believe that the Native Title Act aims to benefit all Aboriginal people, but this is not the case. It's only the traditional owners of that particular land who are entitled to compensation. Mining companies are making millions of dollars profit each year operating on Aboriginal land. Between 1988 and 2008 it is estimated that the minerals industry has contributed some $500 billion into the Australian economy . Companies are not required to pay a minimum return from their mining profits to Aboriginal people, and some mining companies pay as little as 0.25% of their gross revenue to traditional Aboriginal owners . Up until 2019 there was little the Australian courts decided in terms of native title compensation. But in March 2019, the High Court finally confirmed compensation was due to native title holders at Timber Creek, NT. It was a landmark decision, thought to be as significant as the Mabo ruling itself. 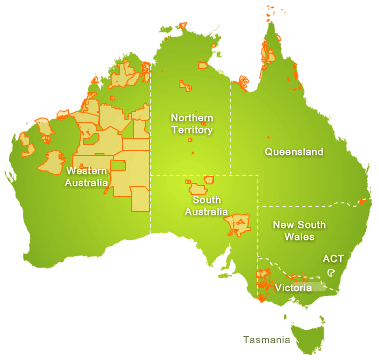 During a native title process Aboriginal land councils negotiate with government. Governments base their negotiations on legislation, but they also have the power to change it to suit their interests. That prompted the Australian government to propose a hasty amendment to the Native Title Act (1993) to protect other agreements from appeal. The government wanted that agreements only needed majority support from native title holders to be valid, a move supported by the opposition. Sometimes Aboriginal claimants wait years for governments to roll out changes their negotiated benefits rely upon, as is the case for the the Miriuwung-Gajerrong people who continue to wait after more than 10 years since their claim was successful. Selective reporting in mainstream media adds to the confusion. Papers and broadcasters focus on the government’s position and supporters but fail to give enough voice to dissenters, probably because it takes more effort to get their voices. Aboriginal Legal Service CEO and former NAIDOC person of the year, Dennis Eggington, says that "the claimant groups are made-up boundaries. Native title legislation bounds claims and the problem I have with that is that at an international level native title has been found to be discriminatory." Land councils should not accept native title, according to Mr Eggington. But in the absence of anything better, Land Councils have little choice. Native title monies paid to Aboriginal groups are eyed on by many parties—Aboriginal council members but also a plethora of lawyers and experts assisting the native title process. Most of the resources for the historic Yorta Yorta native title claim (1994-2006) were "syphoned off by what became the bourgeoning 'native title industry'", a multitude of lawyers and experts who "quickly emerged from the Mabo decision, 1992" . According to Dr Wayne Atkinson, Senior Fellow at the University of Melbourne, "only a small portion of the substantive funds allocated to assist native title holders in mounting their claims ever got to [them]". The majority, estimated to be "at least" 80 per cent, was paid to "members of the industry" . Money allocated for the resolution of native title claims in Victoria . Portion of that money (less than 20%) which flowed to traditional owners to help them mount their claims and organise community participation . Sum native title costs the Victorian government each year. . Cost of the native title process to the taxpayer from 1983 to 2011. . Many involved in native title hold the view that those benefiting from the system may intentionally prolong native title proceedings rather than seek their resolution . No matter if Aboriginal groups received compensation or private payments, those payments might be a challenge to administer. An Aboriginal council who received compensation payments has been reported to have "lost" a sum of more than A$500,000, bringing it to the edge of receivership . Some of these monies were spent on inner-council battles over council membership as not everyone is admitted to the council and must prove that they are of that particular tribe's descent. Les Malezer, Chairperson of the Foundation for Aboriginal and Islander Research Action (FAIRA) in Brisbane, Queensland, criticises the native title system for its failure to deliver for Aboriginal people . "If Koiki Mabo were alive today he would be an angry man," says Mr Malezer. "The rights he won in the High Court have been eroded away by government, courts and socio-economic pressure." "The current system has not achieved good outcomes in land rights. The native title debates have been so constrained that we have been left holding a process which does not work." "It is a process that has been proven to be racially discriminatory, removed from the principles of land rights which has totally replaced the land rights agenda of Aboriginal and Torres Strait Islander peoples." An independent study found that only about 25% of native title agreements deliver "very substantial" outcomes for Aboriginal people, albeit with "enormous variations" . About half of the agreements had only "little" benefits. All weaker agreements were negotiated under the Native Title Act and should not have been signed. "Land-use agreements generally involve sacrifice of native title rights and heritage values supposedly in return for certain benefits," says Greens Senator Rachel Siewert , "however, where Aboriginal communities lack the capacity to negotiate these complex agreements or to ensure that they are enforced, they simply are not delivering." The arbitration process offered by the National Native Title Tribunal (NNTT) is flawed. The process is favouring mining companies and seriously disadvantages Aboriginal people. Research shows that the Tribunal demanded more stringent standards of proof from Aboriginal groups than from companies , a problem that might be rooted in the Tribunal being government-appointed and not independent. Governments in Australia have great interest in supporting mining operations. In 17 cases arbitrated by the NNTT under the Native Title Act, not one single mine was rejected. In 10 of the cases, no conditions were imposed on mining companies and only minimal conditions in the others . The negotiating period for native title claims is 6 months. Companies know that at the end of a failed negotiation process they can go to the Tribunal and request that the mining lease be issued and the project go ahead regardless of Aboriginal stakeholders. The NNTT is not permitted to consider awarding Aboriginal groups money towards the value of minerals taken from their land, which creates pressure on Aboriginal groups to reach an agreement outside of arbitration . The Native Title Act contains no right of veto for Aboriginal people when mining companies intend to open mines on Aboriginal land, leaving them without benefits and a destroyed environment. As a result, the incentive to reach an agreement is compelling and puts a lot of pressure on Aboriginal parties involved in negotiations. "Leigh Creek mine, for example, has had an enormous detrimental effect on our culture," explains Vince Coulthard, Adnyamathanha, chairman of the Traditional Lands Association . "They have dug up a very sacred site and made a huge environmental disaster and we have had no benefits at all from that mine." "There's a lot of misinformation about this issue, but in reality Aboriginal people are very disempowered in this country and native title does not give us the right of veto of any mine." As a result Aboriginal people have to go into negotiations to get the best possible outcomes, Vince says. People occasionally draw adverse conclusions from claimants’ seeming willingness to ‘make deals’ with developers, but they have no choice. There is virtually no ability to stop a project.